Happy Monday and a great start to my week on the 8th week of That Business Show with Jamie Meloni – Where Business Becomes Show Business. I had the pleasure of speaking with 4 guests today, the first of which was Todd Quinzi, Area Director for Jersey Mike’s Subs. Todd was on air today talking about the history and upcoming “Day of Giving” that will be on March 25th. On this day, all proceeds from the sales at Jersey Mike’s Subs will be donated to Camp Hopetake in this area. Camp Hopetake is a critical and nurturing resource for children who have suffered through the physical and emotion pain of a burn injury and the Tampa-St. Pete Jersey Mike’s Subs locations have selected this organization to donate their sales proceeds to on March 25th. Be sure to support this great cause and have a sub at Jersey Mike’s on March 25th! 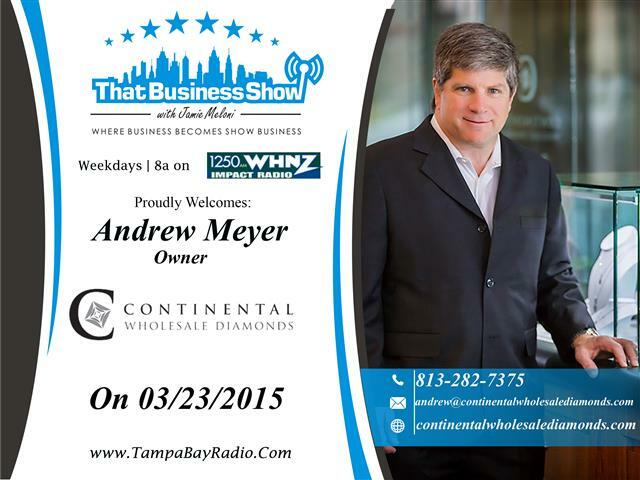 Next up on the show was Andrew Meyer, owner of Continental Wholesale Diamonds which is located at 1715 N Westshore Blvd in Tampa on the 1st floor of the Westshore Centre Building. Andrew is a third generation jewelry designer / wholesaler and spoke of the company’s history as well as his deep educational background in gemology. Continental Wholesale Diamonds is truly a wholesale location and their pricing is much more competitive than the national brands we see on TV everyday. Andrew and his company manufacture jewelry and are diamond importers sourcing directly from the cutters all over the world. When someone comes into Continental Wholesale Diamonds, Andrew and his staff want to make it an experience and all guests are treated like friends and family. They enjoy being able to be part of the life events that jewelry is so much a part of whether it be an anniversary or engagement. For more information, contact Andrew Meyer at 813-282-7375 or email at Andrew@continentalwholesalediamonds.com and visit their website at http://www.contintentalwholesalediamonds.com! 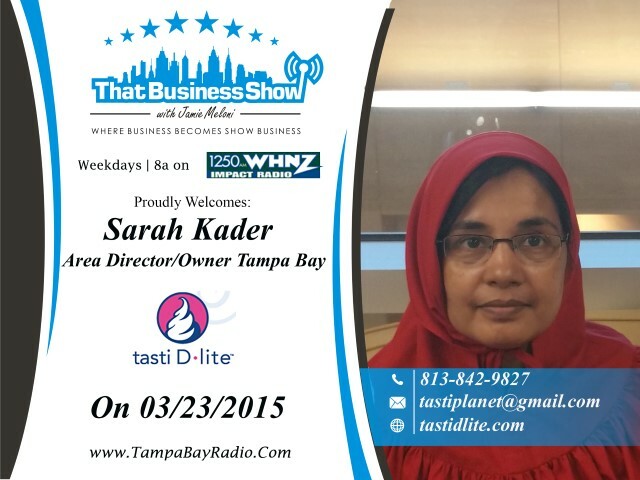 Also on the 2nd half of the show, I spoke with Ali and Sarah Kader of Planet Smoothie. They are Tampa Bay Area Directors and started their franchise operations in 2011. They presently have 4 stores in and around the Tampa Bay region and two more coming soon. Ali and Sarah spoke of their journey to entrepreneurship from a background in engineering and education. At Planet Smoothie, they take the time to source the finest and most natural ingredients for a healthy and satisfying smoothie experience and are always looking to expand. They encouraged anyone looking to invest in a location to contact them for more information. 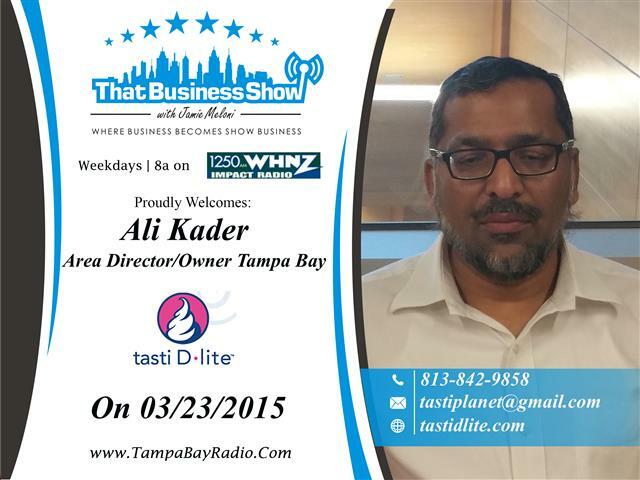 You can reach out to Ali Kader directly at 813-842-9858 or email at tastiplanet@gmail.com and learn more at http://www.tastidlite.com!